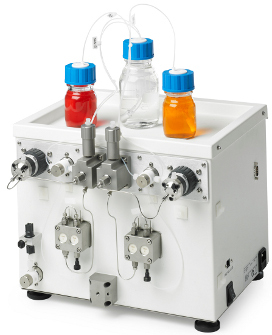 The FlowSyn continuous flow reactor comes with two pumping channels as standard. Adding the Binary Pump Module (BPM) increases its capacity to four channels, making it ideal for multi-component or multi-step reactions using more than two starting materials. The BPM can be used in combination with and controlled by any FlowSyn system. For customers who have their own reactor system, the built-in mixer, inlet/outlet selector valves and integral back pressure regulator ensure that the BPM can also function as a stand-alone reagent/solvent delivery system. For safety and peace of mind, three pressure transducers constantly monitor pressure and system performance. As a stand-alone system the BPM is controlled using dedicated PC control software. Peripherals can be attached using the BPM's built-in coms ports. The BPM operates at up to 100 bar (1400 psi) and can be supplied with standard 10 ml/min heads or 50 ml/min heads. An upgraded version of UQ1022 is also available with a 200 bar maximum pressure rating (UQ1022-200).